Everyone loves a good mystery. Even Fred and Daphne, and they were objectively the most boring heroes of any Saturday morning cartoon ever. He wore an ascot, for God’s sake. Nothing interesting, outside of Charles Nelson Reilly Match Game appearances, ever happens within a three-mile radius of an ascot. Like the land of excess it is, Las Vegas is full of mysteries. (Other things Las Vegas is full of? High heels carried after 1 a.m. Unslept in hotel beds. Publicly professed regrets that you secretly don’t regret at all.) Let’s take a spin through nine unmarked, hidden, or otherwise off-the-beaten-path gems in Vegas you must not miss. New Mexico stakes a claim to “Land of Enchantment,” but what in the world is possibly more enchanting than pizza at the end of your exploration rainbow? Relinquish your crown, New Mexico. Be content with being the Breaking Bad state. 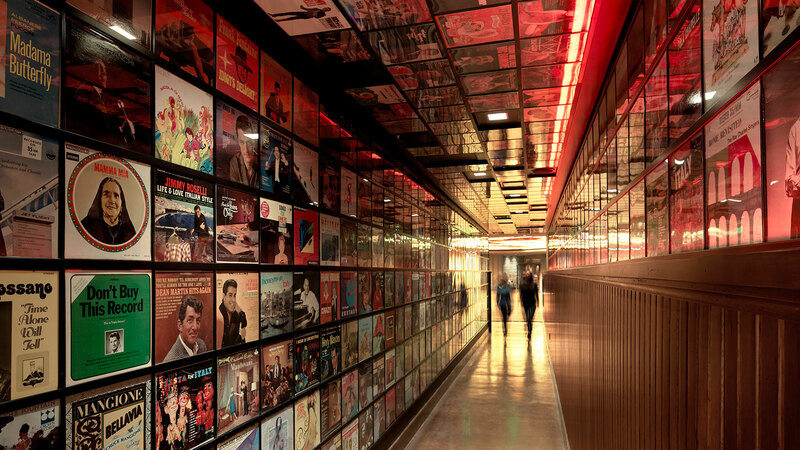 Poke around The Cosmopolitan of Las Vegas long enough, and you’ll find the album cover-lined corridor that takes you to the promised land. A promised land dripping with sausage and pepperoni, which aligns with our own personal belief system regarding the afterlife. First, head to downtown Las Vegas’ Commonwealth. Then look for the clothespin. You’re on your way to the Laundry Room, a speakeasy oasis tucked inside the typically jumping downtown scenester spot. What makes it so oasis-y, you ask? It’s only 28 seats, and you have to text a number to get a reservation. No, we’re not going to tell you what it is. Legwork makes the mystery grow fonder. José Andrés’ Jaleo at The Cosmopolitan is already seven kinds of awesome. Mostly because of jamon ibérico de bellota (cured ham made from the acorn-fed, black-footed pigs of Spain). Fancy ham makes the world go round. You can make your fancy even schmancier with a trip to é by José Andrés, the secret eight-seat restaurant inside Jaleo that serves up a curated chef’s tasting experience—with the chef team presenting a 20-plus course meal right in front of you. To save a spot, you need to book through their exclusive email reservationist (and don’t snooze—they only do two seatings a night!). Membership has its privileges. American Express taught us that in the ‘80s. (Apologies, millennials.) And the privilege at 365 Tokyo, the members-only bar inside downtown’s Inspire? Mind-bending bespoke cocktails that include artisanal ice service and a warm towel when you get in. How you get in if you don’t fork over the $200 in membership dues is a bit of a challenge. Maybe learn a few good jokes and brush up on your flattery. The entrance to off-Strip Italian joint Capo’s has all the hallmarks of a quality speakeasy. You’ll go through your share of bait-and-switch just to get into the restaurant. (Hint: The door isn’t where you think it is. Trust us.) But what you might not notice on your way to the bar is that the floor-length portrait of Al Capone isn’t there to add a bit of Chicago class to the proceedings. (Well, not only that.) Scarface swings open to reveal a private dining room behind it. Best for entertaining your most loyal consiglieri and/or hiding out from nosy revenuers. Why even bother with museums to art and science when we have a museum to pasties and the stone-cold American heroes who wore them? Currently hidden inside downtown’s Art Square, the Burly-Q Hall runs the gamut of important artifacts in burlesque history, from bras to tassels. Soon, the hall plans to abandon its temporary digs for a permanent location at 1025 S. Main St., targeting a March move-in and a June grand opening to coincide with Burlesque Hall of Fame Weekend June 1-4. Tucked into bottom floor of the Soho Lofts (in a space formerly occupied by another unmarked bar) is Millennium Fandom, a little slice of the Mos Eisley spaceport cantina right in downtown Las Vegas. With a stacked calendar of themed nights, your chances of running into a random Deadpool or Catwoman who’s not hitting you up for change on Fremont Street is roughly 100 percent. Aliens? It’s probably aliens. If you can solve this mystery, you’re a better detective than the Weekly World News, National Enquirer and X-Files put together. But there could be a visit from the government in your future if you take it on.